Note: If you can’t do without scrambled eggs or fried eggs, you may need to put in a special order. 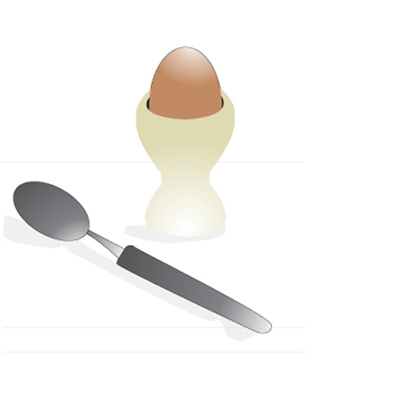 Gather the proper tools — namely, an egg cup and a knife (one with a serrated edge is a good choice). For the very sophisticated soft-boiled egg eaters, there are sometimes cute, little quilted egg cup warmers to keep the egg warm while it’s resting in its egg cup before you eat it. Some people also eat their soft-boiled eggs with a special egg spoon made of nonreactive material such as ceramic or mother-of-pearl material. Carefully aim the knife horizontally approximately an inch from the top of the egg and then decapitate the top. This step actually involves a sawing motion to get through the shell. If you’re a beginner, you may want to make sure that no one’s sitting too close to you, just in case the top of the egg flies off. First, crack the eggshell gently in several places around the top, using the back of the spoon; then peel away enough shell to be able to get a spoon into the egg. This method is safer than the first one. Sprinkle a little salt in the egg, spoon it out, and enjoy. If you like to eat soft-boiled eggs the German way, you may want to purchase some egg cups and egg warmers while you’re traveling through German-speaking Europe. Even if you don’t use them often, these unique items make for interesting conversation about your trip.